Exploring the practice of keeping a spiritual journal is the topic for June’s Tending the Holy Thursdays. Each month on my Thursday posts I pick one theme (or person of faith) to explore deeper. Last week why you would want to write a spiritual journal was introduced and you can read that post here. This week I plan to share 13 tips on keeping a journal. Next week we will explore all the different types of journals and on last week I will share the practice within this practice, my secret sauce, that makes me such an avid journal keeper. During most of the Tending the Holy Thursday themes, I create an additional free resource for you so this mouth there is a Keeping a Spiritual Journal Tip Sheet. You can get this free by clicking on the button at the end of the post. It is my hope and prayer that this series and the tip sheet will enhance your walk with God. The number rule of keeping a spiritual journal is to date your entry. Time flies by so quickly and writing down the date of your entry serves as a guidepost on your life journey. When rereading a journal often I am amazed how long ago I recorded that insight or am humbled that I am still carrying the same burden I thought I let go of years ago. Forget grammar, spelling and perfect handwriting. This is where you can relax and just write. Keep it simple. Keep it open and honest. This is a safe place to express yourself without worrying about getting a grade for perfection. Write out your experience – where you are hearing God or not finding him? What surprised you lately? What are your hopes, dreams, deep desires? What is drawing you closer to God? What is taking your eyes away from him? What verses, words, quotes, books, friendships, trips, interactions, music are feeding your soul right now? A journal is a wonderful place to capture those nuggets of wisdom that helps you grow spiritually. Take them a step further – why at this time and place did that impact you? What is it telling you about yourself? About God? Express your emotions. I used to tell myself not to trust my feelings and I rarely identified and befriended them. Through journaling I name what I am experiencing. I even keep paper that lists different emotions folded in my journal. Sometimes finding just the right word for how I am feeling gives me the strength, the lesson, the avenue to admit the depth of that reaction. For example, instead of writing I am afraid, I chose: disrupted, immobile, vulnerable. For angry I may write impatient or envious. Being alive can also be described as courageous, energetic, and even spunky. Don’t forget to write down your joys and where you are feeling gratitude. I know I am amazed when I pay attention to these surprises during an ordinary day just how much God gives us that we often don’t see. Journaling is prayer. I find writing out my conversations with God helps me articulate my relationship with him. Recording what I think he is saying to me brings me peace, guidance and clarity. I write out the prayers from other people that resonated with me. I find the words to form my own intimate and honest prayers from someplace deep within me. Writing in a journal helps me problem solve and discern a next step. The act of writing out a situation, finding the right words, expressing sometimes surprising emotions, exploring options and the “what if I tried this” ideas, helps me sift and sort my next steps. A spiritual journal isn’t a day to day diary – of mundane details of where and what you ate and if it rained that day. On the other hand, occasionally capturing what is occurring in your life and how it is affected your walk with God is a helpful practice. Write out the depth of gratitude for friendship after a wonderful meal with friends. How the smile of a grandchild warmed my heart and made me wonder how often God smiles as he watches me play at life. How the flowers in the backyard garden remind you of beauty and creativity that surrounds us. A journal can be a place to express pain, sorrow, challenges. Writing out a painful past experience sometimes helps us let go and move on. As I write, a new lesson emerges and I learn something new about myself. God continues to form me through all things and seeing my life in print like this reminds me of his constant presence and protection on my spiritual journey. Even in times of being overwhelmed and confused, writing in short bursts helps me dump all the anxious chaos rattling in my brain and confine them on paper. Sometimes I just use list and bullet points to clear my mind. I have learned that when I read those lists at a later time, that most of my worries and distractions were insignificant and meaningless. Don’t get shackle by the thought you must write daily or even weekly. I do try for every couple of weeks but there have been a few times, several months went by without any writing. I do miss it then though. Instead of something more to do, think about writing in a spiritual journal as a rhythm in life. As a companion to be with you to listen, to help you find your way, to be a conduit to hear God. Speaking of companion, I do take my journal along with me on retreats, to presentations and on vacations. I love capturing my reactions and experiences outside my normal routines where often the different point of view reveals new lessons. 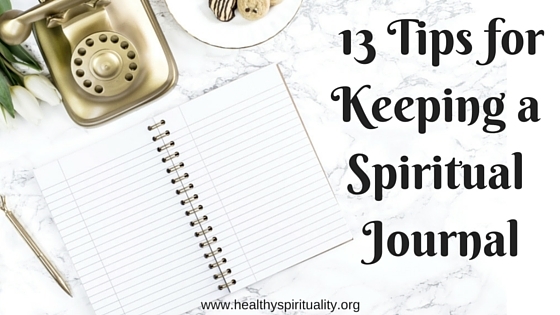 Keeping a spiritual journal may be best in certain seasons of your life. I began one during my first pregnancy. I only wrote 3-4 entries but those words descripting that point of my life with all its hopes, dreams and fears are priceless for me. I know others journal while caring for a dying loved one. Some people go through such intense times that writing out the details takes too much energy or pain – waiting till later may be the best approach. Other people like my great aunt Anna write almost daily for more than 60 years. 2. Don’t make any other rules. Don’t forget to get the free Keeping a Spiritual Journal Tip Sheet by clicking on the button below. Join us next week for more about journaling and if you know someone interested in this topic, be sure to share it with them. Would love to connect with more people for this exciting spiritual journey we are are sharing together. 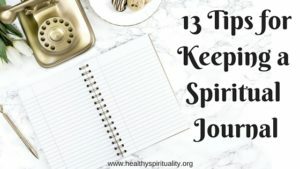 What tips can you share about keeping a spiritual journal? Especially appreciate #4–that list of suggestions of what to include in a journal. Love the idea of capturing bits of wisdom, knowledge, reactions, prayers, etc. Thank you, Jean! This has been a fun topic to write on. Next month I am going to challenge myself to write on a topic I don’t do well. That will be interesting. Thanks for these wonderful tips, Jean! I’m so relieved you didn’t tell us we had to write in our journals daily. Whew! With so much blog writing/reading, Bible study, etc., sometimes writing elsewhere has not taken first priority. I will try to improve!